These Spandex Tablecloths are a true stretch product. Notice the nice contour shape. There are many imitations but ease and contour are delivered only through a true stretch spandex tablecloth. Our stretch table covers are very easy to install for a creative upscale look. Our Printed Spandex Tablecloths have reinforced inserts sewn into the corners for easy, hassle free attachment to table legs. 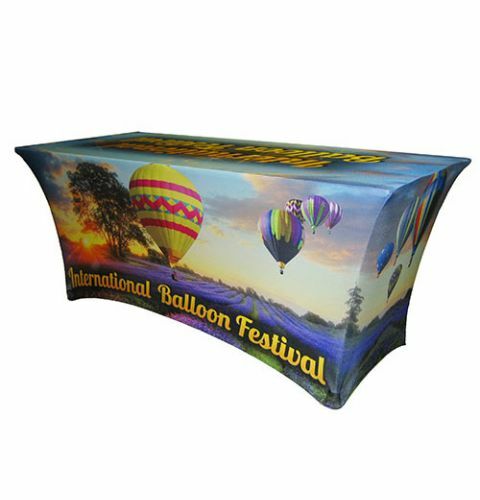 No more worries about a wrinkled table covers at your next trade show, demonstration, or event. Price includes full color imprint of entire tablecloth with your logo or custom artwork. Tablecloths are printed with 4-color process-dye sublimation imagery. Our printed tablecloths are custom made to order with a 4-5 day production time.